Eating out on family holidays is always a balancing act with precision timing required. Go too late and the kids will be overtired and cranky, go too early and the kids will be overtired and cranky. You don’t want them eating chicken nuggets and chips every night but they are overtired and cranky so you need them to eat something rather than fight over getting vegetables into them. My advice: give them a late snack to keep the hanger away, Get the good stuff into them at other meals, fruit with breakfast that kind of thing, and let them order what they want/what you know they will eat at dinner time, and ice-cream too. This was the method we adopted on holiday last year, when our kids were aged 3, 5 and 7. 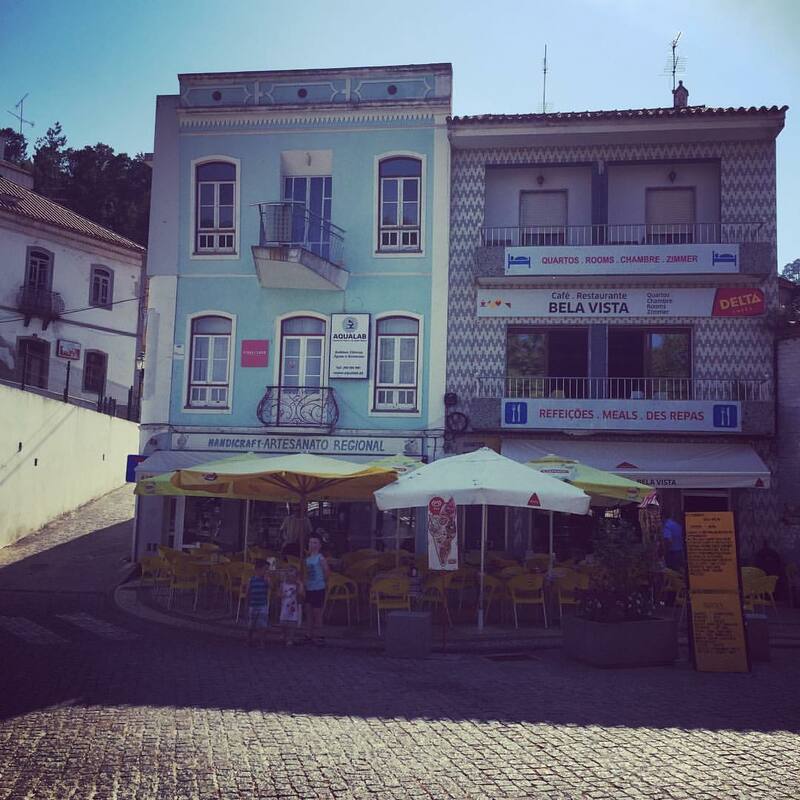 We stayed in Praia da Rocha, and ate out in the evening there and in nearby Alvor, here’s where we ate and what we would recommend. Claire’s: We ate here on our first night, drawn in from the beachfront by the cheap three course menu outside. Staff are very friendly, food is basic enough tourist fare but tasty. The service was pretty slow the night that we were there but they have free wifi. The pork in mushroom sauce was good, but not excellent. It was fine, I pundit avoid it, but it’s not on the must revisit list either. Bulli & Pupe: My son asked a waiter how to pronouce Pupe. Yep, it’s “poop” which he found hilarious. It’s Italian (so many places are!) I’d a lovely lasagne and the pizzas were devoured by the kids. The small girl really enjoyed her tomato soup too. I’d definitely return here, it feels slightly fancy compared to some of the others and is kid friendly. We had very good pizza here and they had colouring, but the terrace is on the road as opposed to a pedestrian street and we managed to knock over a wooden pew type seat, so it’s a mixed score on the family friendliness. See their website here. McDonald’s: (Are you horrified?) After a day of driving to and from Seville by the time we got back to Praia Da Rocha the only option was takeaway, and McDonald’s was closest to our apartment so that’s where we ended up. Happy Meals in Portugal have a soup option (three flavours, Farmers, Cabbage or something else) which in itself was eye opening. There’s a cool outdoor play area with slide, but the Happy meal toys are a few months behind Ireland according to my seven year old. That didn’t stop him eating his chicken nuggets though! This was my favourite meal of the holidays. The food was excellent and the staff were so friendly and engaged with the kids from the moment we walked in. A waiter even took a crab out of the tank and let the kids touch it. He also put lollipops in his pocket and told the kids he was watching them and wanted good behaviour and every time he’d walk past he’d give them hand signals to say he was watching. They loved it. Service was very quick. We fought over the “couvert” of bread, sardine paste, olives and chorizo. Our five-year-old really enjoyed the fish soup (to my shock!) and my chicken with orange and almonds was excellent. A delicious fresh fruit salad made a nice change from ice-cream for dessert. Go early as it gets very busy and justifiably so. Churrusqueira De Mercado: This was a recommendation from a friend, a real authentic place. The food is basic (chicken, fries, fish) but well done, but we were disappointed with the poor service on the night, half our meals forgotten, water not being given after ordering three times and the staff were quite rude. It was very busy though, and eating the chicken it was clear where the recommendation came from. Pepperino: A pizza place on the hill in Alvor, we sat outside on the terrace and watched the busyness. The kids asked to go back here a second night and we were all glad that we did. The pizzas are very good, the staff friendly. The dessert of icecream with smarties went down well too. 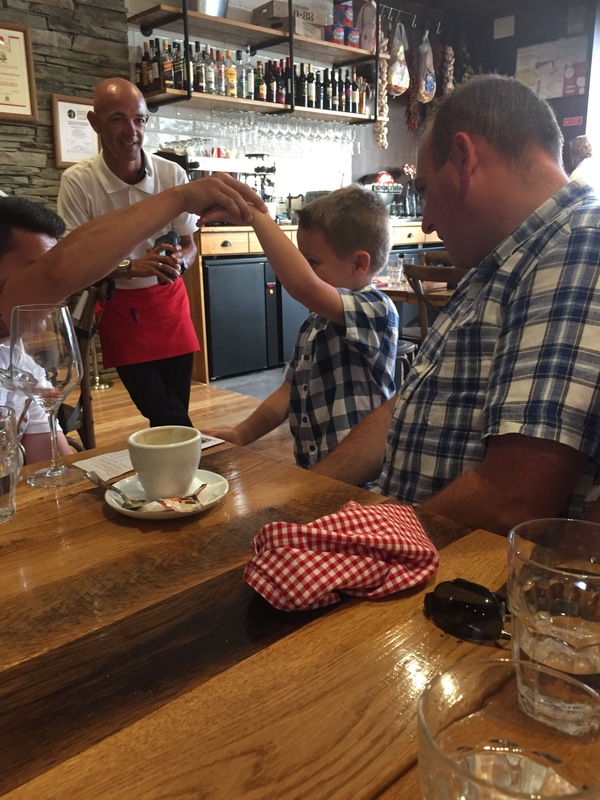 Tip: Go early, we had really quick service and very attentive waiters (one even did a magic trick for the kids) on the night that we sat down at 6.30pm, they were too busy later to engage as much. Kids’ menu is fishfingers, pizza, chicken nuggets, spaghetti bolognese. Cake on the outside terrace at the Cafe Ingles in Silves, sitting outside on the terrace. Go to the castle too, but it’s almost worth the drive just for the cake. We had fantastic churros from the churro stand outside the lighthouse at Sagres a culinary highlight of our trip. Sitting on plastic chairs in the square outside this restaurant in Monchique eating Piri piri chicken and hotdogs. algarve, bumbles family travels, eating out, Holidays, portugal, restaurants, travel. Bookmark.